We examined the transits against the EU and the United Kingdom on the date of the (recently passed) "Brexit" referendum in this post. Today we look at the contemporary periods shown using the ancient Hellenistic "Zodiacal Releasing" technique as taught by Chris Brennan, using his free online calculator. Columns from left to right are "levels" from large/major to sub/minor. Note that the "Level 3" (third column, red) subperiod containing the referendum has a "lightning bolt" icon at the upper right. This signifies a change in state or culmination relative to the containing "Level 2" subperiod (which began on 12/21/2014). Also note that the purple line above the "Level 4" subperiod starting 7/15/2016 (shortly before the referendum) which also denotes a change in state. So, on the EU level, the Hellenistic technique gives us hints that something significant was going to change. 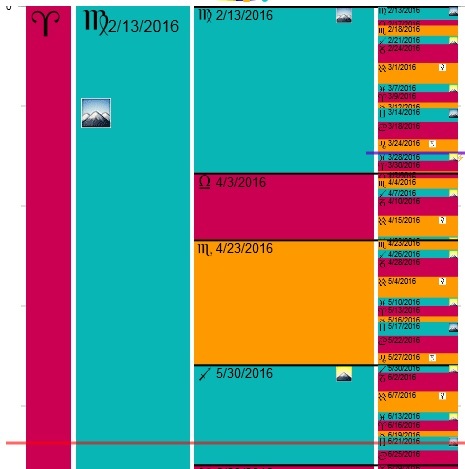 Note on the date of the referendum (June 23 2016) the subperiods from Level 2 to Level 4 (all but the far left column) are the some color and all have a "mountain peak" icon. This is a clear indicator of a "peak" in achievement according to the technique and generally corresponds with when one's career experiences high points. The Zodiacal Releasing technique thus suggests "change" for the EU... and (I think) very good things for the United Kingdom on the referendum date.